Full sun in the morning at 14 h.
State of play by babysitter. Rent by the week or by the month. Beaulieu sur Mer is a charming seaside resort located between Nice and Monaco. Town mountainside. 2 Beaches (10 min walk), Marina, numerous tourist activities. Town center 5 min walk. Peaceful resort of 4000 inhabitants with 30 restaurants, casino, sailing club, diving. Numerous walks by the sea to Saint Jean Cap Ferrat and Villefranche. situated between Nice and Monaco. 2 beaches (10 mins by foot), marina and many tourist activities. Town center 5 mins by foot. Towards Saint Jean Cap Ferrat and Villefranche. s, Nice or Monaco. Many more nozzles. 5th and top floor with elevator.
. Exceptional sea views from Cap Ferrat to Cap d'Ail. 30m2 living room with 2 leather sofas. Monthly rate: EUR 1300 in low season. We had a great stay, we found it so relaxing. Christal, the caretaker/ housekeeper was wonderful and very patient with two who speak little French. The flat is well situated and well provisioned, though two beach chairs would have been appreciated. We hope to return for a longer stay next time. We enjoyed our month-long stay very much. We know Beaulieu very well, and so were very happy with the location which is convenient for the town centre, the port and the beaches. The gardienne was also extremely helpful and made us feel at home. We, a retired English couple, spent a week at this apartment in April 2017. This was our first visit to this part of France. The gardienne was immediately available when we arrived and gave us a thorough introduction to the apartment. We found the apartment spotlessly clean and very well-equipped. We enjoyed a very comfortable and peaceful stay. We found ample shopping facilities within easy walking distance. We were reliant on public transport. From what we'd found out in advance we expected to find that the railway station and bus stops would be within easy reach and this was indeed the case. On departure day we needed to hand back the keys and leave the apartment by 7.45 am and the gardienne cheerfully met us in good time. We would have no hesitation in booking a further stay at this apartment. 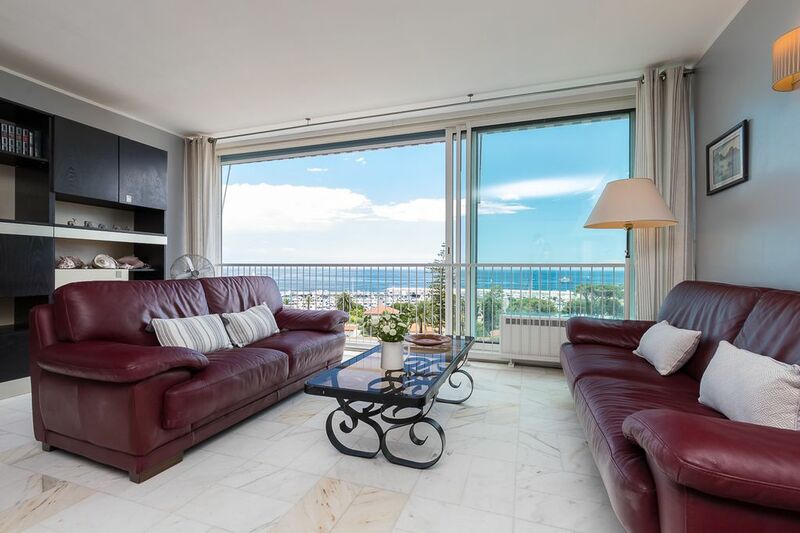 Marc has a beautiful apartment with a panoramic view of the sea with cliffs on one side and Cap-Ferrat on the other, from all rooms. It was very comfortable and clean and well-maintained. The location was ideal - quiet (except for the occasional passing of the train, which did not bother us) and very convenient to the sea-side parks, various buses, trains, and shops. We thoroughly enjoyed ourselves and hope to be back for a much longer stay. Wonderfully, spacious apartment in Beaulieu with a spectacular view. Beaulieu is small enough to be quiet but large enough to have restaurants, shops and a great supermarket. The apartment is within a 5-10 minute walk of the rail station, bus stop, shops. We did not have a car but there were at least 2 trains per hour in each direction on the main line and the 100 bus (Nice-Menton) runs every 20 minutes. The apartment has floor to ceiling glass sliders in the living area and bedroom with a view of the bay from one end to the other. We could not bear to fully close the shutters and block out that view! The apartment is fully equipped including a dishwasher (but no hair dryer). Only drawback is the nearness of the rail line which can be noisy if you have the windows open and are trying to go to sleep. Trains do stop between about midnight and 5 am. It was worth putting up with a little noise for the view and convenient location. I am very happy to be able write a positive review about this apartment. We stayed here for a month in March/April 2014. The apartment is large and voluminous compared with others that are available on the market. It has an amazing panoramic view to the Beaulieu-Sur-Mer marine. Communication with the owner, Mark Erly was very good from the beginning and straight forward during the rest of the time. We are actually very happy to have the chance to meet him for a coffee between his travels. We would certainly recommend this apartment to others and hopefully would have a time and chance to stay there again. M.D.